Roulette is a type of casino game that is interesting to play and fascinating to watch. Its rules are simple and easy to learn by newbie. The betting system is simpler than in other types of casino games available these days and this game is also a fast paced one. Roulette game environment is also nice and it is player-friendly that is why it became so famous among casino players. On the other hand, roulette is also a strict game with limited odds though players can bet multiple times. Do you know that there is no skills required for you to win the game? It’s just that you shouldn’t expect for this game to provide you with a good fortune because that will not happen though. Roulette game is merely a game of chance and the odds may always be in favor of the house so you shouldn’t expect to make a fortune out of the game even if you know you have mastered all the rules in playing it. In a roulette game there are 36 numbers on the wheel slots; the colors of the numbers are always in an alternate mode from red and black. You can also find 1 or 2 zeros in green color on the slots too (depending on variation you play). In every round the dealer will spin the wheel and place a tiny ball at the outer verge. Players can now bet on the result of the spin just by putting their bet on the table while the game is going on. Except for seeing the ball you will also see some signs meaning that you have to stop betting, like the dealer waving the hand over the table. This is a sign that you cannot bet anymore because that is not officially allowed during that time. Once you see that the ball dropped in 1 of the slots, you will also see that the dealer places a marker and that will be visible on the layout. This is just a sign that there is already a winning number. The dealer will now collect the bets of the losers and then the dealer will pay the winners. In a French roulette you will see that the pockets of the wheel wherein the ball is caught upon stopping of the spin have labels of 1-36. The pockets have alternating colors of red and black and there is also a green O pocket as well. 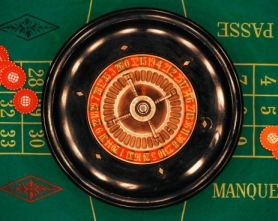 The only difference of the French roulette from the American version is that there is a green pocket which is marked as OO (doubled zero). A lot of people go to casino to play and to be entertained and coming across roulette wheels just encourages them to try their luck since this is a game that is not hard to play and it also allows multiple betting that other games don’t. You are free to choose the betting system that you want and which is best to manage your bet as well, so you won’t go home bankrupt.